AT A SMALL SOCIAL ENTERPRISE LIKE OURSELVES, HELP IS ALWAYS WELCOMED. DO YOU WANT TO COME TO BEAUTIFUL ZAMBIA TO VOLUNTEER OR DO AN INTERNSHIP AS A PART OF YOUR EDUCATION? OR DO YOU HAVE AN IDEA HOW TO HELP US FROM YOUR OWN COUNTRY - PLEASE LET US KNOW BY SIGNING THE FORM BELOW AND WE WILL GET BACK TO YOU. WAYAWAYA is such a nice and fun place to work at. The ladies working here are so nice, friendly and loving. Since I started at WAYAWAYA, I have always said when people have asked me how it is to work here, that the ladies are the best colleagues I have ever had. What I have liked the most working here, is that I have had so many diverse duties, everything from pop up shops to quality check products to managing our Instagram account to taking care of tourist-groups etc. I like when not every day is the same and different things and projects are happening. Since Livingstone is a tourist town, there’s often a lot of different happenings and events which WAYAWAYA is a part of, which is then a great place to socialize and connect with new people. This is one thing I also love with working and living in Livingstone, you meet new people every day from all parts of the world. Livingstone is such a fun town to live in, there is a lot of things to do and people to meet. There is a big expat community here to be a part of if you want to, where people are very friendly. Since we have the Victoria falls just next door, there is a lot of activities connected to the falls you can do, except for entering the national park and look at it. You can go white river rafting, one of the most popular activities here. You can go on helicopter rides over the falls or if you are more of a daredevil, fly microlight over the falls. 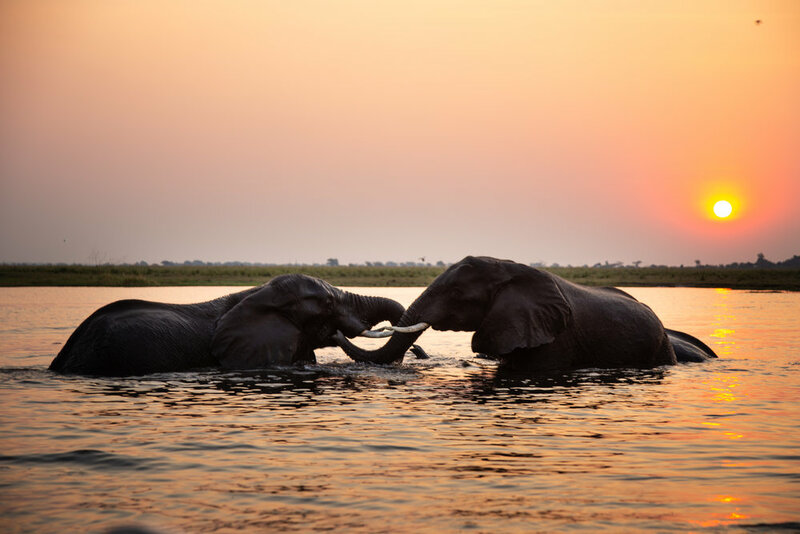 You can go on boat cruises at sunset on the Zambezi river which is basically having drinks and snacks and watch animals such as elephants, hippos, crocodiles and so on. If you dare, you can do the bungee jump from the Victoria falls bridge or go for the less scary choice and do the zip line over the gorge. While on the bridge, you can just keep walking to get in the Zimbabwe and the cosy town Vic Falls where you can get some nice food and some proper IPA beer from the town’s brewery. Botswana is one of the bordering countries so it’s easy to go over and do a one-day safari, or more days, in Chobe National park. If you want to go travel a bit further and for a longer time, you can go over to Namibia to explore this beautiful country with a variety of different landscapes. There is also a lot to see in other parts of Zambia; like the Chimfunshi Nature Reserve where you can go to say hi to our cousins – the chimpanzees.